Wanted to share this short film about young crofters in Scotland figuring out ways to gain access to land, to practice small scale agriculture and local food production. Passionate, inspiring people. We need to keep informed about agriculture oriented towards energy production. In the case of maize in Britain, there’s also a terrible association with soil runoff during excessive rain events that contributes to flooding, as in this piece by George Monbiot with it’s quite shocking video component. A responsible climate change policy would take into account both the importance of good land management (as nudged or not by subsidies) and actual carbon figures, which Miles King, in the post shared below, discusses so clearly. 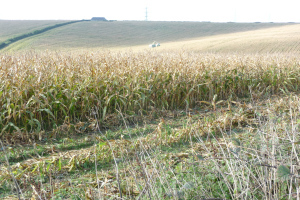 Maize grown specifically for Anaerobic Digesters to produce “biogas” is an increasingly common crop in England, especially in the South West. The area under Biogas Maize increased by 55% in 2016 compared to 2015, to 52000ha. The National Farmers Union set a target of 200,000ha of land under biogas Maize back in 2011, so they are 25% of the way to their target. Nessie Reid is a creative food activist working on issues of waste, access to land, and as the film above shows, on the political ecology of the dairy industry through a project called The Milking Parlour. Recently she arrived in a public space in the city of Bristol with two cows. We can read about her mission, and the agricultural and environmental issues she raised, here.